When Sonny Brandt started a Dallas-based air conditioning company in 1952, he saw the opportunity created by a growing population and hot Texas summers. His strategic expansions over the years grew a small local business to a thriving leader in the construction and design industries. More than six decades later, Brandt is bigger and better than ever. From our days as Brandt Engineering, Brandt Mechanical, & Brandt Service in the 70s and 80s, the firm has grown to a suite of companies, offering full-service solutions as a single provider to large and complex asset construction and management projects. Brandt added Brandt Electrical in the early 2000s. 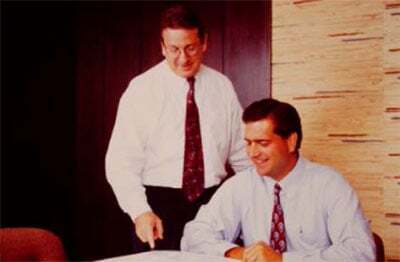 The Brandt Companies were created under the leadership of Barry Moore and Mark Zilbermann in an ever-expanding quest to provide our clients with on-time, in-budget construction service, complete commissioning assistance, and long-term facilities maintenance. We expanded into HVAC service and full-service MEP operations. Today, we also pride ourselves on cutting-edge energy efficiency through LEED programs. With offices in all of the major Texas cities and over $500 million in annual revenues, Brandt has established itself as the largest MEP services contractor in the state. With in-house capabilities that start with build/design, construction and commissioning and end up in service, Brandt works every day to provide the solutions and service to meet your ever-changing needs.